As the official 2013 Topps Chrome Baseball release approaches, Topps has announced that several subjects will come as redemptions. 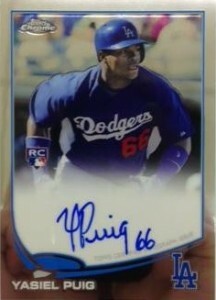 A popular inclusion, Yasiel Puig, comes as a redemption, but several are already in-house and a live version of the card can be seen on the right. Topps also revealed that they will begin to regularly update collectors on the status of player signings using their social media outlets, inlcuding Twitter, Facebook and Tumblr. The plan is to have weekly updates every Friday. A full list of the redemptions found in 2013 Topps Chrome Baseball can be viewed below. Total cards are noted when available. How can they even release this product with so many redemptions? There has to be some legality issues.